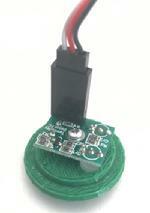 The Fascia Controller plug in to our servo controllers to provide an easy way to control your turnout. 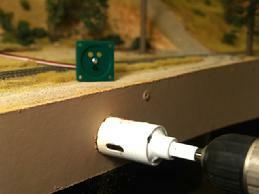 Plug the fascia controller in to our servo controllers to both actuate the board and to indicate its status. There are 4 optional colors available. 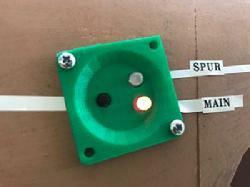 The Red-Green will have one LED Red and the other Green, when the button is pushed the turnout will throw and the Red and Green LEDs reverse. 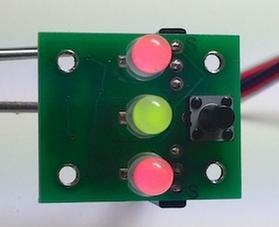 The Red-Red, Green-Green, and Yellow-Yellow will have one LED lit and the other dark. Buy in quantity and save. 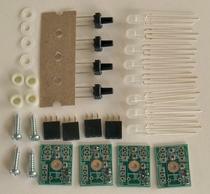 Contains PC boards and parts needed to build 4 fascia controllers with bi-color LEDs (3-lead type). The resistors and transistors are pre-mounted and the board tested. An advantage of building from the kit is that you can mount the components on a control panel anywhere you wish and then wire them back to the PC board. 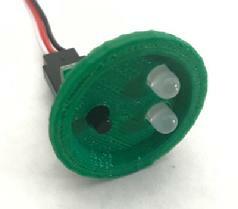 Servo extension cord not included in kit. 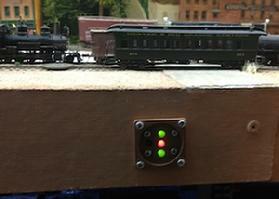 The Y extension can be used with the fascia controllers to provide two control points for one switch. Y cables can be used to connect more than one fascia controller to a single input. 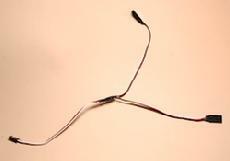 Y cables are used to attach two or more fascia controllers to one output. 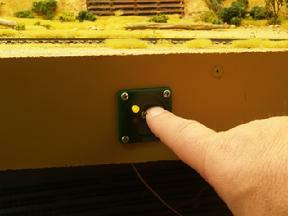 Pressing the button on either controller will throw the turnout and the LEDS on both units will change to indicate the direction. View of the back showing the recessed edge. Made out of 3D printed PLA plastic. 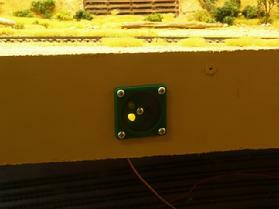 Here is one mounted on my layout using a Red/Red fascia controller. I angled it to match my trackwork. Drill a 1/-3/8" hole in the fascia and attach with 4 screws in the corners. 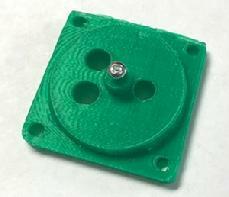 3D Printed of precision PLA, a tough easily painted easily painted plastic with a rough texture. Simply use a 1-3/8" hole saw to place on your fascia. The four included screws hold it securely in place and the recess keeps the button safely out of the way of bellies. Can be spray-painted a different color or used as is. Mounts in a 1" hole on fascia using silicon caulk. Rotate to desired angle. Fascia Controller is held on with a screw from the back. 3D Printed of precision PLA, a tough easily painted easily painted plastic with a rough texture. Simply use a 1" hole saw or Forstner drill to place on your fascia. Uses silicon caulk or another glue to hold in place. Rotate to desired angle to match track plan. 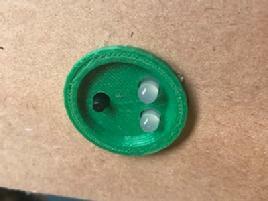 The recess keeps the button safely out of the way of bellies. Can be spray-painted a different color or used as is. 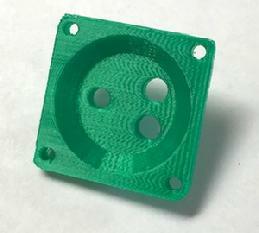 Size 1.25" x 1.25" x 1/4" deep (without parts mounted). 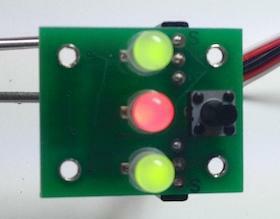 This version of the fascia controller is designed to be used on single and double crossovers. 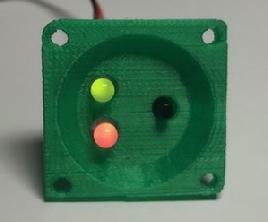 It has 3 red/green bicolor LEDs arranged to indicate straight through (top and bottom green) and crossover (middle LED green). It has 2 output cabless to activate 2 inputs. 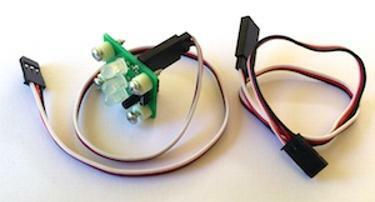 For single crossovers you can use these 2 outputs to activate the 2 servos needed. 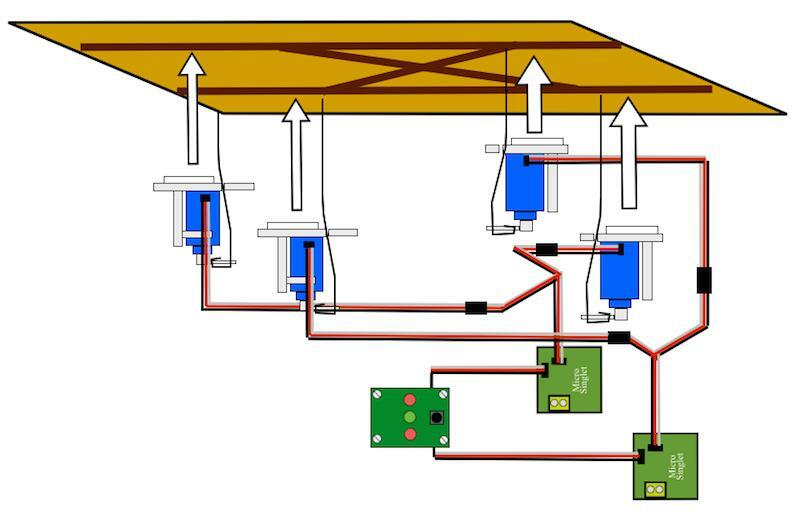 For a double crossover you need 4 servos - this is done by using 2 Y cables to drive 2 sets of paired servos. 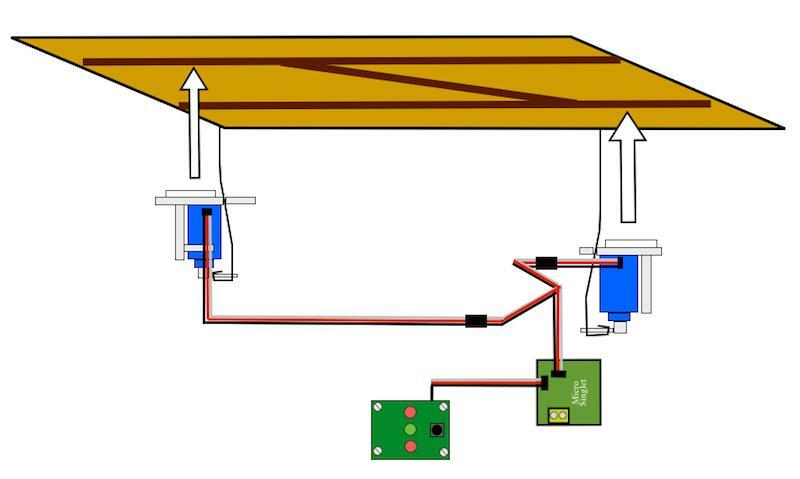 (Note: for most servos one output can drive up to 3 servos, with 2 Y cables, but not 4 at once). 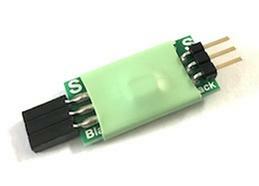 The 2 outputs are isolated from each other by diodes so they will not interact with other (which can be a problem without the blocking diodes). 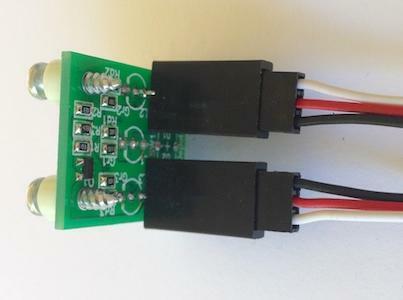 They can be used on 2 seperate boards with the following caveats: the 2 boards must use the same power supply (can be DCC) and the they must be connected with the same polarity to the power supply. Single Crossover Set Up using a Crossover Fascia Controller connected to a Micro Singlet. 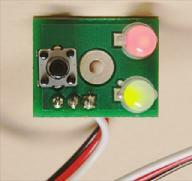 Can also use with any other board that supports Fascia Controllers. 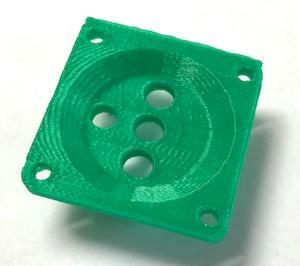 Crossover Fascia Controller with 4 mounting screws and 2 cords. As above except that the 3-lead LEDs and the push-button switch are not mounted so that you can arrange them on your panel as you wish. 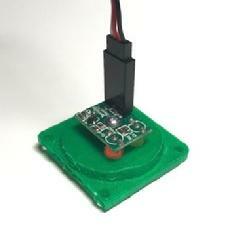 In order to get the colors of the LEDs correct note that they have a flat side which is corresponds to the flat line on the back side of the board. Requires soldering. 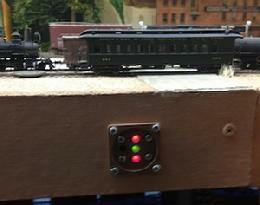 The Crossover Controller in action mounted on a fascia of a layout with the optional mount available below.